Cloud ear—it is kind of a rather exotic sounding name for a type of fungus. Cloud ear has been featured in Asian cooking since the sixth century, and the Chinese name for cloud ear is mo-er, or "little ear," which makes sense since it does vaguely resemble a human ear when fresh. Cloud ear grows on trees such as the mango and kapok and goes by several names, including black Chinese mushroom, black fungus, wood ear fungus, and tree ear fungus, to name a few. In Chinese cooking, it is also sometimes referred to as "Black Treasure." Cloud ear is often confused with wood ear, a distant relative of the cloud ear fungus that also grows on trees. While cloud ear is smaller and more tender, the two types of fungi can generally be used interchangeably. The cloud ear—a species of jelly fungi with the scientific name auricularia auricula—is somewhat elastic and gelatinous, as well as silky to the touch. This fungus can be between two and eight inches in diameter and does not have much of a stem or any "gills" (the ridges in the underside of the mushroom) but instead is cup-shaped and wavy. The color of the cloud ear takes on the color of the tree on which it grew, so it can range from dark yellowish brown to dark brown or even black. Like tofu, cloud ear has no flavor of its own but instead soaks in the flavors that it is cooked with. The delicate, crinkly fungus is also valued for its crunchy texture. You'll often find cloud ear added to hot and sour soup, and it is also featured in stir-fried dishes as well as Szechwan and Hunan cuisine to absorb some of the spicy heat. Before using, you will need to soak the cloud ear fungus in warm water for at least 15 minutes—they will puff up to several times their normal size. Then rinse the fungus and trim the stem where it was attached to the wood of the tree. Cut the mushroom into an appropriate shape and size for your dish, and add them near the end of stir-frying, so that they do not lose their crunchy texture. Cloud ears are sold mainly in dried form, in plastic bags. If stored in an airtight container, they should keep for up to a year. Besides hot and sour soup, cloud ear fungus is included in other popular Asian dishes such as mu-shu pork, egg rolls, fried rice, and Buddha's delight. 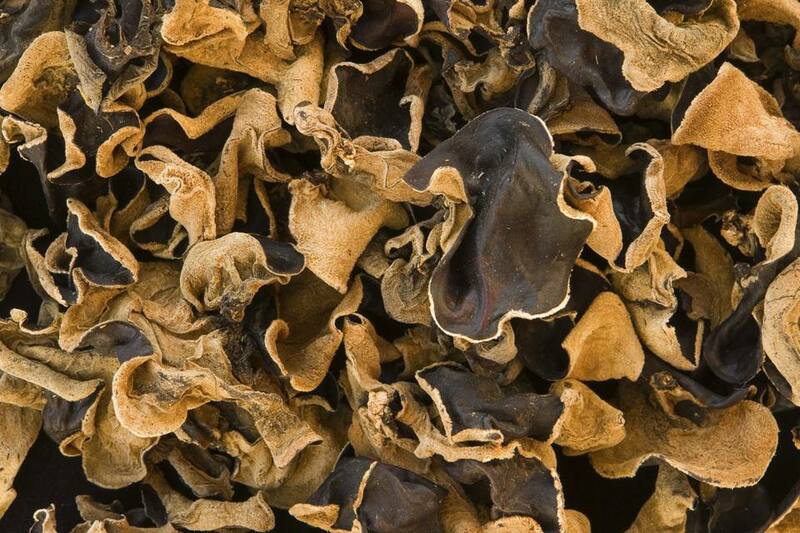 Feel free to use cloud ear in any recipes calling for black mushrooms.